Now days most free hubs are made from alloy, over-time these can chew out especially if you havn't correctly tensioned the cassette lock ring. Also the bearings inside the free hub wear out and without specialist tools those bearings can be very difficult to remove. Its usually easier just to change the entire free hub once its worn. Also some users might swap from Shimano to Campagnolo or from 9sp to 10sp systems. 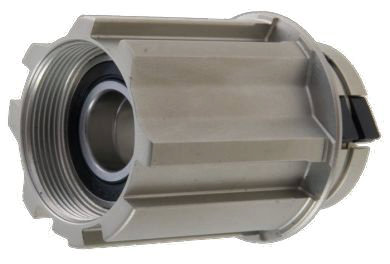 All free hubs come with a replacement dust seal and if necessary a replacement drive-side alloy cone. The Gavia wheels using our Bolzano hub require an additional washer when swapping from Shimano to Campy and that washer is included with the Campy hub body. Please specify which part you require in the comments section at the checkout. It is important you tell us exactly which wheelset you have to ensure we supply the correct part. If you require a freehub body not listed, please contact us via the link at the bottom of this page as we may have it in stock or we maybe able to order it in. The stock list on these is difficult to maintain but we are trying. The free hubs are generally pretty easy to replace with only basic tools, please read the wheelset manual which you can get from our downloads section. If AFTER reading the manual you are unclear then feel free to pickup the phone and call us when you are in front of the product for assistance.